The return of Kevin Garnett to where his NBA career began and reached certain impressive heights was emotional and most importantly successful, helping the Minnesota Timberwolves beat the Washington Wizards 97-77. Besides the emotions of the “welcome back” video made for him, it took the Timberwolves a lot of time to get into the right mood for this evening. They scored just 11 points in the first quarter, falling 15-3 behind at one point. But the Wizards are so bad right now they can’t even beat a team that seemed shell shocked from generating some national interest for once, completely shutting down on offense and allowing Kevin Martin to look like the star he used to be. Martin led Minnesota with 28 points on 10-of-15 from the field, backed up by Andrew Wiggins scoring 19 points and Nikola Pekovic with 15. It seems Garnett is the first person to ever yell at Pekovic since he arrived to this league, or at least that’s how Ricky Rubio is telling it. 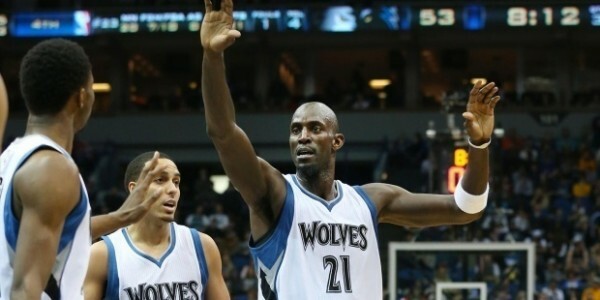 As seen in a link below, Garnett is going to pay special attention to Wiggins in the short time he has before he becomes a free agent and probably retires, trying to bring over as much experience as possible to the man who is going to be named rookie of the year in three months. Garnett is also the fourth oldest player in the NBA right now (although Nash is hard to count). He’s 18 years, 295 days older than Zach LaVine (7 points off the bench). That’s the second biggest age disparity between two teammates on any NBA team this season, trailing only the 20 years and 295 days between Steve Nash and Julius Randle of the Los Angeles Lakers, both out for the season. Garnett didn’t do anything special. Just five points and eight rebounds in 20 minutes. That’s pretty much all you can expect from him in terms of box score stuff. But the Timberwolves didn’t bring him back for his scoring and rebounding. It’s more about his leadership and ability to yell at players, or simply be who he is. It might not get them into the playoffs, but maybe in the short time between now and the end of this season, he adds just about enough to the young players that are supposed to lead this franchise in the future.